This music is an intimate journey. It is a reflection of experiences and dialogues with myself and others. It is about losing and finding oneself, about growth and awakening, as well as longing and silence. When Silence Falls embraces the understated beauty of being perfectly imperfect. It is an humble portrait of humanness, in which fragility and strength become one. It is about the rise from falling. The movement of honesty. 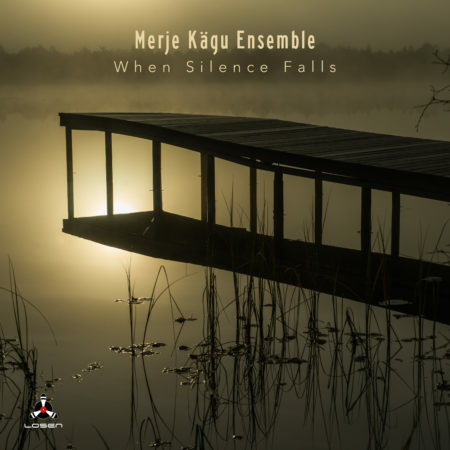 When Silence Falls is the guitarist Merje Kägu’s first solo album as a composer and ensemble leader. The group, which was formed in 2016, in Gothenburg, not only brings together musicians from around the world, but also from different musical backgrounds – classical, world and improvisational music. Åsa B. Johansson is a multi-musician and singer from Gothenburg, Sweden, who likes to combine different music genres and styles while singing, playing her violin, accordion, piano or saxophone. She likes to be in environments where world, folk, classical and jazz music crossover. Åsa is often requested as a soloist, but is also very fond of creating music with smaller groups and ensembles. She is a member of several ensembles, such as Göteborgs Alternativa Orkester, Slabang and duo Åsa and Johan, and artistic director of Stråf Vocal Strings and Amanda Choir. She is also very experienced in choir conducting and singing. Leonor Palazzo, a Belgo-Argentinian cellist, was awarded a Masters Degree at the Royal Conservatory of Brussels in 2009. To broaden her musical horizons she studied in the Department of World Music at the Academy of Music and Drama of Gothenburg. Now living in Sweden, she is a competent and respected player of traditional Swedish music, playing together with major musicians in several different groups, including a duo with a Swedish National Fiddler Ellinor Fritz, « Ellinor & Leonor ». Working as a freelance musician since 2010, she regularly takes part in a wide variety of musical projects including Ensemble Bradamante (Baroque music), WoodsFolk (Folk rock), Anna Heikkinen & Längtans Kapell (Finnish tango), Göteborgs Alternativa Orkester (World music), Alla tiders ensemble (Musical theatre), Merje Kägu Ensemble (Classical/Jazz), Stars of the Lid (Ambient) and performed together with New Tide Orquesta (Minimalism/Tango nuevo) and Tokso Folk String Quartet (Folk). Leonor has toured in many countries throughout Europe, USA and Korea and promotes cello through workshops. She has released two CDs: “Nordic Folk Music” with Septentrio for ARC Music, London and “Mormors trädgård” with Ellinor & Leonor. Jesse Ojajärvi is a Helsinki based drummer, involved mostly with jazz and improvised music. He’s an active member of bands such as Harri Kuusijärvi Koutus, Hyväluoma Group and the Selma Savolainen Quartet. Anders Jormin is an internationally acclaimed double bassist and composer from Gothenburg, Sweden. He has been an ECM recording artist for many years and has received numerous prestigious awards and prizes for his unique artistry and expressive music. He was the first ever contemporary improviser to be elected into the Royal Academy of Music in Sweden. As a composer, he has written a comprehensive repertoire of music for choirs, chamber orchestras and smaller ensembles. His first symphony was premiered in November 2015. Anders Jormin is professor of Improvisation at the Academy of Music and Drama at Gothenburg University, where he has participated in building a leading department for improvisation and world music. He is a honorary doctor at the Sibelius Academy in Helsinki, Finland as well as at the Academy of Music and Theatre in Tallinn, Estonia. Blanca Sans Ballart started her musical studies in her hometown of Tarragona in Spain, before going on to study at the Academy of Music and Drama at Gothenburg University. Today, she works as a classical musician, playing in orchestras throughout Europe. She has always been curious to try new styles and formations. That is why this project has been such a growing experience for her, both professionally and personally. Marina Cyrino has studied music in both Sweden as well as her homeland of Brazil. Currently a doctoral student in Musical Performance and Interpretation at the Academy of Music and Drama, University of Gothenburg. Her main interest is to explore and transform flute playing through a multimodal approach, flowing seamlessly between interpretation, composition and improvisation.